Considering her picture from different angles, Mila adds a few letter-shapes – a couple pointy marks reminiscent of M’s and repeating lines like L’s. Early writing skills develop following the same sequence of stages. 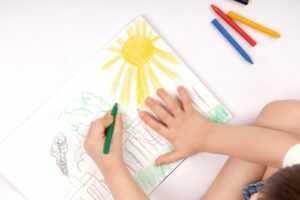 Children begin to make connections between the marks they make on a paper and a message they wish to convey. As children grow, they develop the motor control and literacy skills necessary for early writing to emerge. At Stepping Stone School, we are laying the foundation for future success in literacy as we provide children with early opportunities to develop their writing skills. Writing opportunities should focus on modeling functional print for children to encourage them to interact with writing in meaningful ways. Writing their name and the names of their friends is much more meaningful to children than writing the letter “A” 10 times. Providing a meaningful context for writing provides a purpose and adds value. In our prekindergarten classrooms, a pad of paper is made available in the dramatic play center for a child to take another child’s order. At home, parents can provide children with a piece of paper to make their own grocery list before going to the store. Ask your child to read what he or she writes on the list. Ask the child to read his or her writing to you. This helps children connect written and spoken language. 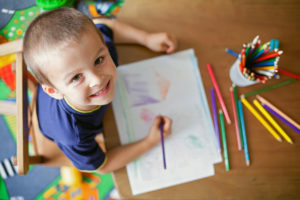 Observe children as they are writing or drawing. The story often comes alive in the creation of the picture. The process is as important as the final product. Celebrate children in their writing. Display children’s writing with care in a special place to revisit it together. Celebrating children’s writing builds motivation for future writing.